Socialize with your fellow entrepreneurs as you get inspired by Anton Diaz of Awesome Planet, Annabelle Wisniewski of Raintree Restaurants and Chef Tony Elepano of Chef Tony's Popcorns, all of whom will show you more than a thing or two about starting your own food business. More food business ideas are in store in this edition of the Entrepreneur Networking Nights! Socialize with your fellow entrepreneurs as you get inspired by Anton Diaz of Our Awesome Planet , Annabelle Wisniewski of Raintree Restaurants and Chef Tony Elepano of Chef Tony's Popcorns, all of whom will show you more than a thing or two about starting your own food business. 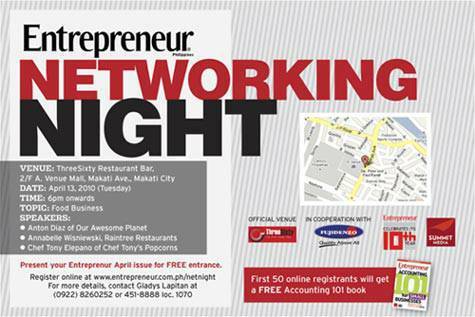 Be there at ThreeSixty Restaurant Bar, 2/F A.Venue Mall, Makati Ave., Makati City, on April 13, 2010 (Tuesday). Registration begins at 6pm. The first 50 Online registrants will get a FREE Entrepreneur Philippines Accounting 101 book! Just bring a copy of the March 2010 issue of Entrepreneur Philippines magazine to be a part of this entrepreneurial experience. If you don't have one yet, don't fret! Copies are available at the registration booth. Come, join in! Who knows? You might meet your next supplier, major client or future business partners here with us. Be there!